Svadhisthana Chakra – Reproductive Organs, Large Intestine, Pelvis, Kidneys, Bladder, Lymphatic System and all the body’s fluids. Manipura Chakra – Digestive System, Stomach, Liver, Gallbladder, Kidney, Pancreas, Spleen, Adrenal Glands, Small Intestine, Lower Spine and Sympathetic Nervous System. 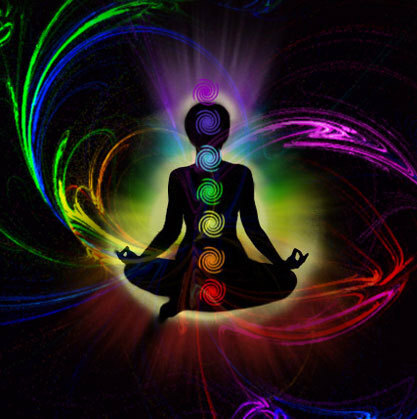 Anahata Chakra – Heart, Lungs, Brochial Tubes, Thymus Gland, Immune System and Skin. Ajna Chakra – Brain, Nervous System, Eyes, Ears, Nose, Sinuses and Face. This week we will be using Yoga asanas together with the Bija Mantras to awaken and balance the Chakras to facilitate healing and help balance the body, mind and spirit. We will also be working on the posture Ardha Matsyendrasana, the Half Twist. This posture aligns the spine, builds strength in the trunk, opens the shoulders and massages the internals organs, increasing energy levels.